Runners Connect » » Training Articles How Fast Should Your Easy Runs Be? A common question, and one of the more difficult concepts of training to comprehend, is “how do easy runs help me race faster”. If you want to run a marathon at 9 minutes-per-mile, how does running 5-8 miles slow, or even your entire long run, at 10:30 pace help you? Wouldn’t running all your miles as close to 9 minute-pace as possible make more sense? Logically, it would make sense that pushing your easy run pace as close to race pace as possible would help you get fitter quicker and ultimately run faster. After all, the harder you work the better you get, right? Yet, most good coaches will tell you to run slow on your easy days and your easy running cadence should be the same as your other runs. We found that running 80% easy will make most runners 23% faster, which you can read more about if you need the research. The answer to these questions lies in what coaches call the aerobic system. The aerobic system, and thus aerobic development, is the one true secret to training and it’s the key to unlocking your potential. In this article, we’re going to examine why the aerobic system is so important, what the aerobic system is, and how to target it in training. Why Do I Need to Run Easy? The first step to understanding just how important the aerobic system is to distance running is to identify the percentage of energy contribution the aerobic system provides for races 5k and longer. 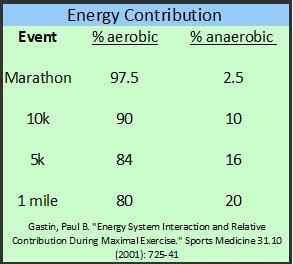 As you can see in this chart, even for a “short” event like the mile, over 80% of the energy required to run the race is produced via aerobic metabolism. Looking at the research and the scientific data, we now know that the aerobic system is extremely important to distance running. But, what is the aerobic system and how does developing it help you run faster (if you’re always running so slow all the time)? First, we need to understand exactly what the aerobic system is and how it relates to easy running. At the heart of aerobic training is the scientific fact that to exercise, your body needs to break down sugar and convert it to glycogen so it can be used as energy or fuel. In the presence of adequate oxygen, the body utilizes the aerobic system, also known as aerobic glycolysis, to power continuous running. In the aerobic system energy ATP is produced through Pyruvic Acid and Lipid/Protein fragments entering the Kreb Cycle and the Electron Transport Cycle. During aerobic respiration, you breathe in, the body efficiently uses all the oxygen it needs to power the muscles, and you exhale. When you are “running aerobically” (or running easy), your muscles have enough oxygen to produce all the energy they need to perform. Improving your capacity to transport and efficiently utilize available oxygen to produce energy will enable you to race faster. This makes up 85-99% of the energy needed to race. As running easy is aerobic development there’s no better way to train the aerobic system. Now that we understand what aerobic running is we can examine the specific physiological adaptions that occur when you develop the aerobic system. Capillaries are the smallest of the body’s blood vessels and they help deliver oxygen and nutrients to the muscle tissues while shuttling waste products out. The greater the number of capillaries you have surrounding each muscle fiber, the faster you can transport oxygen and carbohydrate into your muscles. Aerobic training (easy running) increases the number of capillaries per muscle fiber. How does this help me run faster? This improves how efficiently you can deliver oxygen and fuel to your working muscles and how quickly they can clear waste products. Myoglobin is a special protein in your muscles that binds the oxygen that enters the muscle fiber. When oxygen becomes limited during exercise, myoglobin releases the oxygen to the mitochondria to produce more energy. How does this help me race faster? The more myoglobin you have in your muscle fibers, the more oxygen you can sequester to the muscle under aerobic duress – like during a race. Aerobic training increases the myoglobin content of your muscle fibers. Mitochondria are microscopic organelle found in your muscles cells that contribute to the production of ATP (energy). In the presence of oxygen, mitochondria breakdown carbohydrate, fat, and protein into usable energy. Aerobic training increases both the number and the size of the mitochondria in your muscle fibers. There are a few other physiological benefits to aerobic training, but that discussion gets a little too scientific and likely only interesting to biology majors. Aerobic development is the single most important factor to long-term development. Sure, track workouts, VO2max sessions, and tempo runs will increase your fitness and are still important to racing faster. However, nothing will consistently help you improve continuously like developing the aerobic system. Why Doesn’t Running Faster on Easy Days Make Me Get Faster in Races? 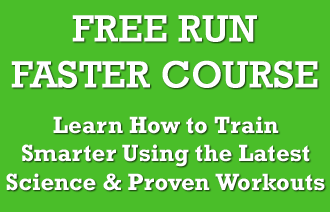 Won’t running faster and pushing harder on your runs develop the aerobic system more rapidly? Not only will running faster result in diminished aerobic development, but it increases the chances of injury and overtraining. This is the single biggest mistake runners of all experience levels make in their training. Since I firmly believe that understanding the “why” of training is critical to executing workouts and training correctly, and I don’t expect you to take my word for it. What is the best easy run pace for me? Scientific research as been able to identify exactly how the aerobic system responds and adapts to certain training paces. Research has shown that maximum stimulation of myoglobin in Type I muscle fiber occurs at about 63-77 % of VO2max. 63-77 % of VO2max is about 55-75 % of 5k pace. A little easier to figure out, right? Two researchers, Holloszy (1967) and Dudley (1982) published some of the defining research on optimal distance and pace for mitochondrial development. Holloszy found that maximum mitochondrial development when running at 50-75 % of V02max. Likewise, Dudley found that the best strategy for slow-twitch, mitochondria enhancement was running for 90 minutes per outing at 70 to 75 % V02 max. Your optimal easy run pace for aerobic development is between 55 and 75 % of your 5k pace, with the average pace being about 65 %. Running faster than 75% of your 5k pace on your long run doesn’t provide a lot of additional physiological benefit. In fact, the research indicates that it would be just as advantageous to run slower as it would be to run faster. 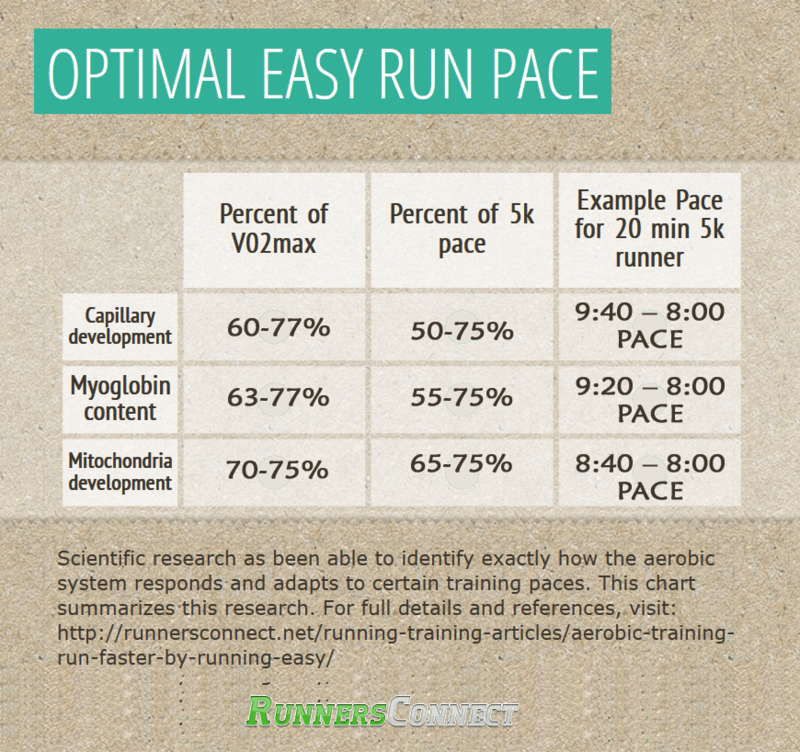 Even though 50-55 % of 5k pace will seem too easy, the research clearly demonstrates that it still provides near optimal physiological aerobic adaptation. Download your FREE Aerobic Pacing Calculator now in your members-only download section. Need help figuring out your exact easy pace based on your 5k time? Download our FREE calculator and we’ll do the math for you. Why can I not run faster on my easy days if I feel good? Ok, so we can clearly see from research that running faster isn’t going to develop your aerobic system more rapidly. But, what’s the harm in running faster on those days you feel good? Why do coaches always harp on you to slow down? The faster you run on your easy days, the more stress you place on the muscles, tendons, ligaments in bones. For example, you may be able to head out the door and hammer out an easy day and feel fine with your breathing, but your hips might not be strong enough yet to handle the pace or the consecutive days of faster running and, as a result, your IT band becomes inflamed. In addition to aerobic development, easy days can function as active recovery from your hard workouts – but not if you run them too fast. After a hard workout, your muscles will have micro-tears from the forceful contractions which happen at fast speeds. These micro-tears cause muscle soreness, and make training the day after a hard workout difficult. The body heals these small micro-tears through the circulatory system, which delivers the oxygen and nutrients to the muscles that need repair. 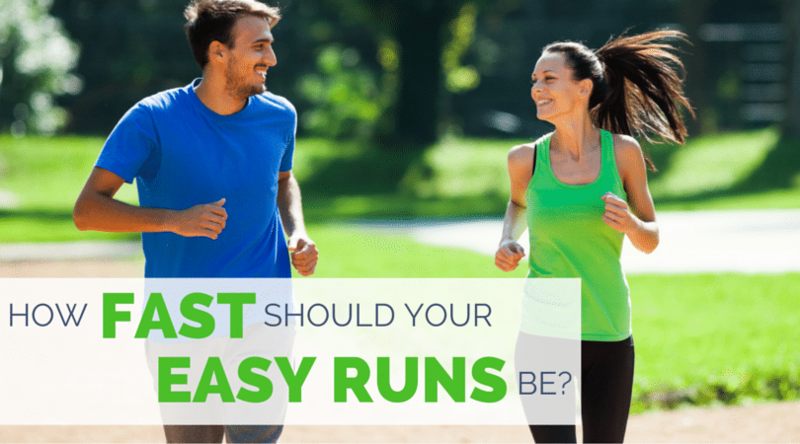 Easy running delivers oxygen and nutrients directly to the muscles used during running. When running easy enough, the stress and micro tears that result from running are virtually non-existent, so the recovery outweighs the slight muscle damage. Why do we struggle to run easy? The reason these two realities are so difficult to understand is that they don’t occur instantaneously. You don’t run slightly too fast one day and then immediately get hurt. The stress and fatigue compounds, so it’s difficult to attribute it to one run. But you know what to do to make sure you do find the right pace for your easy run to allow for recovery and prevent you being on the verge of overtraining or injury. And if you don’t, we have the calculator to do it for you. Wow, thankyou for this excellant article. I love to know the ‘why’, it makes me a better runner. Being an avid spokesman for running & tri, I can now use this info to help others avoid errors… My dream is to be a professional trainer (after I retire), information like this is wonderful. I will follow your guidelines to run a BQ this year. I’ve been doing this for over a year using a heart rate monitor. I’ve seen miracles. I don’t wear the monitor as much now, but I have a good feel for a slow run. It makes running so much more enjoyable and my races so much faster and enjoyable. Thanks for the article on why we need to run easy to perform at our best in distance races. I really like the fact that you included links to research that supports the notion that slower running leads to maximum mitochondrial development. Do you know of research papers that also support your other two points about myoglobin and capillary development? Also, I noticed that you mentioned that slower speeds aid in the development myoglobin in Type 1 muscle fiber. What about for the Type II muscle fibers? I have a very high proportion of Type II so I need to develop those as well. Great article – I was alway of the view that slow runs are mainly used for recovery and gave little benefit as they were to slow. Question – Can cycling be a substitute to developing cardiovascular aerobic fitness as a substitute for running? Reason I ask is that I have been running 3 days a week and have come out of injury. I am currently using the bike as a substitue for my easy runs. I find that cycling by default keeps my average heart rate around 130bpm. My cycling sessions are usually around 1.5 to 2.5hours in during twice a week. Yes! If you are coming back from an injury, cycling is a great way of making sure you are able to keep your cardiovascular fitness up. Its great that you make them so long, that will only benefit you, especially if you are able to bring your heart rate up. Do you have access to an Alter-G/Underwater Treadmill or an Elliptigo? As those are better able to simulate running, they are better for you as a runner. However, as long as you are still able to run 3 days a week, your body will be used to the running motion. Do you see yourself running more in the future, or is this a long term change? Nicole asked how to know if you are running too fast. I’ve been using Long Slow Distace training for a long time and this is how I personally do it (I’m a cyclist but the principle is the same). First of all you need to buy, steal or borrow a heart rate monitor. You then go through the pain of establishing your maxiumum heart rate (Get yourself checked out by your doctor befor attempting this). I personally define my max HR as the rate I can keep up for a minute. Mine is about 195 so I then take that times 0.65 which gives me about 125. Now I train a few times with an HR monitor and ensure that I’m around 125. At the same time I gague my speed and also how it feels at that pace. For me, I know that if I’m averaging about 25kmh and can hold a conversation with myself or sing a bit, I’m in my LSD zone. I hardly ever use my HR monitor for these rides anymore, other than to calibrate fom time to time. Ps. One thing I’d like to add to the article. If you do most of your training in this zone, it also allows you to make your high intensity sessions high quality. One question: OK, running too fast at an easy day is not only not recommended but also can be proved unnecessary as well. What about extending the volume of an easy run? Let’s say the weather is perfect, I am chatting with a few co-runners and I do 1 or 3 miles more than suggested. Is there any bad in it? Is there any good? Hi Thanasis, glad you enjoyed the article. It really depends on your running volume total. If you are around 20 miles a week and you go those extra miles, you will need to back off the rest of the week, or take a day off after. It is fine to keep going with friends, as long as your total volume for the week does not go up more than 10%. Hopefully this helps! Good article. Is there a point though where you can run too slow on your easy recovery days or on long runs? I often run my easy days and long runs with my wife. I’m just under 20 minutes for a 5K And she’s 24 minutes. I will usually run around 9:45-10:45 pace with her to make sure she isn’t going too fast on those days. Could I be losing fitness or slowing improvement by doing this? Thanks. Hi Eric, thanks for reaching out. That should not be a problem as your PRs are not too far off one another. That pace for you should not be too slow, and will help you recover more, as long as you are still incorporating the workouts into your training at your pace. It is very good that you are supporting her, and this should help you both improve! Does this answer your question? Can we help with anything else? Yes that answers my original question perfectly! Thank you! Since that question we’ve decided to run our first full marathon. She is trying for around 4:15:00 race time and I’m looking to go under 3:45:00. I’ve read that the long run is more of a workout during marathon training so should we still run the same paces as before or split up our paces for the long runs? She’s been consistently at 35-40 miles per week and I’ve been at 40-45. Thanks again. Hi Rebecca, it does not really matter your age as such, but more your current fitness. It will all depend on what your body can handle as an individual. This pace calculator should help you determine your easy pace a little more if you have a race or hard effort to put in. Hope this helps! If you are looking for more information on masters running, we just created a new masters running page https://runnersconnect.net/masters-running/ hope you enjoy! Thanks so much. I will be checking those out. How do I get the calculator to work on my computer? Thank you for not only laying out the concept but backing it up with solid data. I believe in the concept of the majority of miles being slow to make you faster (especially when it comes to marathon). However I am trying to reconcile this with the Run Keeper Marathon Plans you have posted. Many other marathon plans have far less steady pace work (especially on those long run days). Yet, I know that a lack of solid pace work for those longer runs can be where you see some pretty big blowouts in say mile 21-22. I believe there is something to more steady miles (especially in the long run) but trying to find the evidence to back this and your training plans up. When it comes to struggling at mile 21-22 in a marathon, a lot of emphasis has to be put on the pace prior to that point in the race. I think a lot of marathoners that struggle at that point will look back, post-race and say next time they’ll do more long runs, eat better, etc when the reality is often, they simply went out too hard.